I’ve taken the idea that skiing is a state-of-mind to a new level this year. Some in my family would argue that this isn’t entirely a good thing. But I’ve come to the conclusion that the best way to dress when you’re off the slopes, is in clothing that tells the world, “I am a skier. I love to ski. 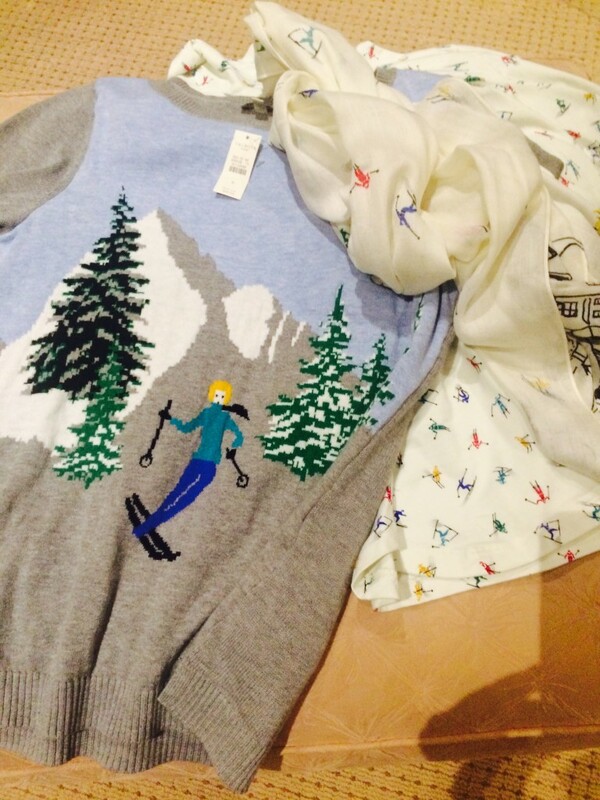 I even wear clothes with skiers on them!” Bear with me. Recently, my good friend Shari had sent me a photo of a cute sweater she found in the Talbot’s outlet. Neither of us are regular shoppers in that store, and yet, their sweater selections caught our attention. She popped into the store one afternoon and hit the jackpot: a sweater with a pattern that depicts a skier carving turns (stylishly, of course) down a tree-lined slope. My style-minded spouse and oldest child looked at me, incredulously. But young Seth aligned himself with me and Shari. “You NEED that, Mom! It’s awesome. And you and Shari will MATCH.” He said with all the urgency only a seven-year-old can muster (which is to say, quite a bit). The other two looked on, quizzically, as we high-fived. Fortunately, the doubting duo know to humor the person who makes sure that the ski bags are packed every night. [Which is how, on a recent afternoon, while Seth was at a play-date, they came to walk into Talbot’s with me, wearing their best game-faces.] To our delight, a dear friend’s mom was working in the store—and she produced not just the sweater, but also a turtleneck with a pattern of little skiers all over it. “Oh, and what about the skier scarf?” she asked, proffering one from a nearby rack. Sold, sold and sold. I grinned from ear-to-ear, as my middle-schooler shook his head in anticipation of the sheer embarrassment of being seen with me, dressed in theme clothes. (Silently, I reminded myself that if I’m not embarrassing my kid, I’m doing something very, very wrong.) My husband pointed out that I had owned a similar turtleneck, back when we first met, over 25 years ago. It occurred to me that he may not have meant this in a good way. Still, nothing could dampen my glee. Once home I admired my loot and took a great deal of joy in photographing the apparel. I sent the photos to Shari, “I will take your skier sweater, and raise you a skier turtleneck and a skier scarf. I WIN!” She immediately wrote back that she’d be returning to the store to complete her own set. This emboldened me to send boastful text messages, photos included, to a few friends who have, like Jeffrey, known me since the last time I thought that these items were at the height of fashion. I would be lying if I told you that the responses were not filled to the brim with celebrations of my awesome style. I will be modeling this look all over town. I have paired the scarf with basic black leggings and turtleneck, and the sweater with a pair of motorcycle-style jeans in a light blue that perfectly matches the shade of the sky on the sweater. Clearly, it’s not a “technical” piece, but what fashionistas (like, ahem, myself) would call “a statement piece.” So, I’m now on the hunt for retro-styled ski clothes—you know, Fair-Isle knits, and maybe a more technical version of the cute, printed ski-turtlenecks of my childhood. I draw the line at the neon-colored one-piece ski suit—for now. What is your skiing state of style? Tweet me @BariNanCohen or @Deer_Valley.